Right about now Robert Downey Jr. is working on the big-screen sequel to last year’s adrenalized version of Sherlock Holmes from Lock, Stock and Two Smoking Barrels director Guy Richie. In the meantime, Conan Doyle nuts can get their fix with the first series of Sherlock, a modern day take on the classic sleuth from acclaimed Coupling and Doctor Who screenwriter, Steve Moffat. The Guinness Book of Records cites Sherlock Holmes as the “most portrayed movie character,” with 75 actors having played the part in over 200 films, and it’s no surprise why. This Sherlock calls himself, “a highly-functioning sociopath,” gifted in the art of deduction but with little interest in anything other than the mental challenge of solving complex crimes. He’s asexual, indifferent to social conventions, and (not without good reason), often arrogant. It’s up to his more socially-adept friend and flatmate, Dr. John Watson, to help him to function in a world so averse to the extraordinary. Holmes is a freelance detective, called in by Scotland Yard’s Detective Inspector Lestrade, who is here portrayed charismatically by Rupert Graves as himself a very competent detective (as distinct from, for instance, Eddie Marsan’s comedic portrayal in Richie’s version). Holmes superpower – and he is, in modern terms, a superhero – is his obsessive sense of observation and ability to perform outstanding feats of deduction. The most logical of heroes he, like Hugh Laurie’s House (who is partly based on Holmes) is both similar and the complete opposite of an equally outcast, and equally work-obsessed, figure like The X-Files Fox Mulder, who by contrast is highly intuitive rather than rational. 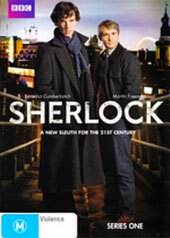 Aside from the consistently witty (and often funny) writing, the strength of this version, presented as three 90-minute BBC telemovies (“A Study in Pink”, ”The Blind Banker” and “The Great Game”), is the brilliant performances from the wonderfully named Benedict Cumberbatch as Holmes, and Martin Freeman as Watson, and the seamless way in which familiar elements are updated to the present day. Holmes as an anti-social drug addict? He loves texting, hovers on Internet message boards and has three nicotine patches to calm his racing brain. Watson’s journals? He keeps a blog. And the eponymous Hansom cabs? The classic, and absurdly expensive, London black cabs. The latter is one of the few concessions to fidelity over common sense, as co-creator Mark Gatiss says in one of the two audio commentaries: it just wouldn’t be Sherlock Holmes if they were commuting to a crime scene on a public bus. The first and last of the films are the strongest and are directed by stylish film-director Paul McGuigan (Lucky Number Slevin). He gives the series an energetic visual style leagues above the bland 60-minute unaired pilot version of “A Study in Pink” (a curiosity included as an extra on the second disc). One of his most impressive, and elegant contributions, is presenting Holmes’ SMS messages as on-screen text, thus preventing the need for inserts and emphasizing the slick, modern take on the material. Downey’s Jr.’s take on Holmes is entertaining, but he’s unfortunately constrained by the necessities of the big-budget blockbuster film. 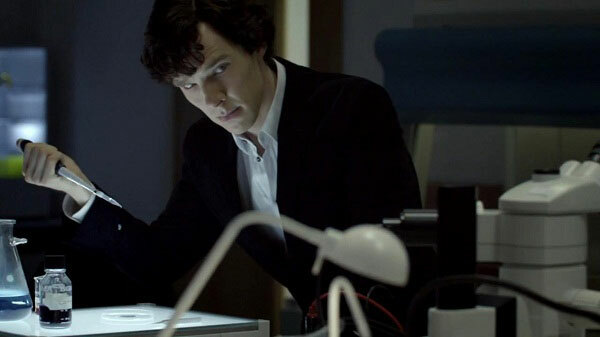 Sherlock is truer, more fascinating portrait of this oddly attractive character. Freeman and Cumberbatch nail the at times prickly but close relationship between Holmes and Watson, a friendship all the more fascinating for what is left unsaid. Holmes especially has bigger things on his mind – not least of which is the looming supervillain Moriarty who, on the basis of the cliffhanger which ends this season, may become the focus of the second series when it rolls around in mid-2011. The two-disc blu-ray is technically peerless. The evocative greys and blues of wintery contemporary London are crisp, and McGuigan’s slick shooting almost reaches J.J. Abrams’ level of lens flare. The 5.1 mix is nicely balanced without being extraordinary, and David Arnold and Michael Price’s zippy score is both energetic and hummable, even if it seems to stylistically borrow from Hans Zimmer’s racing-brain take on the character. In addition to the original 60-min pilot version of “A Study in Pink” and a half-hour behind the scenes documentary (“Unlocking Sherlock”), there are two entertaining feature commentaries. 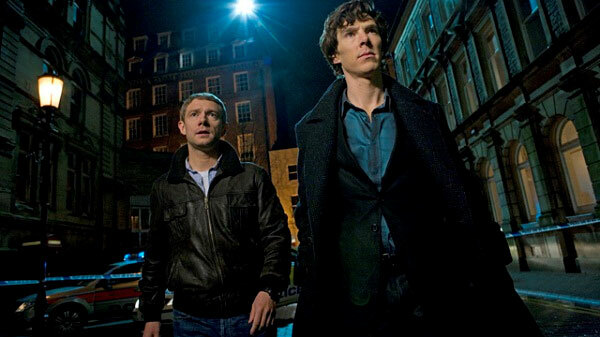 The first, on “A Study in Pink,” is from co-creators Moffat and Gatiss and producer Sue Vertue. It covers the series’ creation as born over numerous train-journeys on the commute to work on Doctor Who (where Moffat is currently executive producer). The second, on “The Great Game,” features Gatiss, Cumberbatch and Freeman, which after a slow start becomes highly entertaining and informative. It’s worth it for Cumberbatch’s hysterical Alan Rickman impersonation alone.